unwittingly rob a bank in the pretext of making a movie. Revised Final Draft: March 30, 1967. Filming Dates: April 5-7, 1967 (this episode); August 2, 1967 (musical numbers). Original Air Date: September 18, 1967. Rerun Dates: April 1 and September 9, 1968 (NBC); November 15, 1969, January 30 and May 29, 1971, September 2, 1972 (CBS). �Randy Scouse Git� Written by Micky Dolenz; Produced by Douglas Farthing Hatlelid. Michael, David and Micky enter old abandoned Mammonth Studios, where two sly con artists, J.L. posing as a movie director and his sidekick Harvey persuade them to do a movie portraying bank robbers and they're instantly dressed in suits carrying Thompson submachine guns. J.L. asks for photographs of them so Micky presents a baby picture of himself. Since the crook wants recent photos for publicity, Micky, using a camera on a tripod, snaps a photo of Michael and David with J.L. and Harvey which J.L. discards along with Micky's baby picture into the wastebasket. Then J.L. sends the guys to The Ninth National Bank to do a robbery scene claiming the cameras are hidden and tosses them some scripts of lines to use, telling them to ad-lib the rest. J.L. tells Harvey his scheme is foolproof: either they will get rich, or The Monkees will be caught and go to jail! The guys hold up the band while David flirts with the cashier in between, get 50 grand, and return to the studio, amazed at the quality of their acting. They find Peter, who missed joining his pals for the great holdup scene since he had gone to stage 1 at 2:00 instead of stage 2 at 1:00. J.L. pays them each $100 and then tips off the cops. Later, When police converge upon the pad, Peter at first thinks its about his overdue book to which he opens the door slowly and slides the book out. When the cops still don't leave, The Monkees think it�s another shooting; the Sergeant orders one of his officers to go in after the boys. The nervous cop enters the pad clutching a machine gun and attempts to apprehend the boys, stammering and shaking; Micky criticizes the cop on what he thinks is bad acting and gives him direction on how to be ruthless and steely-eyed. The cop leaves and reemerges to shoot up the place with a stream of bullets! At the station house, shown the pictures of them taken by the banks automatic cameras, Micky, Michael and David�surprised the film print is black and white instead of color�still think it�s just a movie. In a fantasy sequence, Peter enters with popcorn for the movie, while David is being blocked up a kissing couple and Michael by a woman with a large hat. 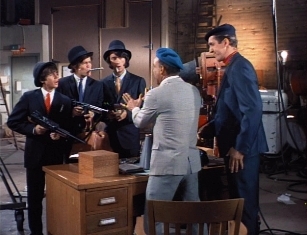 Then the sergeant books them for armed robbery�which convinces The Monkees that their situation is real! They try to explain to him that they thought they�re were shooting a movie but he doesn�t buy it and soon has the trio in the interrogation room to interrogate them which just leads to comical antics as they put on sunglasses when the lights are shining on them and literally change their tune, spill the beans, each get the third degree and have the book thrown at them but all end up being charged for armed robbery and incarcerated. While in jail, Peter arrives bringing the guys some files (nail files!) and a lawyer. Both Peter and the lawyer believe they�re guilty and the lawyer winds up charging them $40,000 plus carfare since they just robbed a bank and the three decide they need another lawyer. “The Picture Frame” (a.k.a. “The Bank Robbery”) was the first episode of The Monkees to be produced for its second season, a good nine days after The Monkees finished recording their third album The Monkees’ Headquarters. It was also one of 10 second-season segments to be filmed from leftover first-season scripts! Others were the previous episode, "It's A Nice Place To Visit...", the next episode, "Everywhere A Sheik Sheik", Episode No. 36, "Monkee Mayor", No. 37, "Art For Monkee's Sake", No. 38, "I Was A 99-lb. Weakling", No. 40, "Monkees Marooned", No. 49, "The Monkees Watch Their Feet", No. 52, "The Devil And Peter Tork", and No. 57, "The Monkees Blow Their Minds", all of which were shot during this first phase of season-2 episode production (April-June 1967). Goffin & King's “Pleasant Valley Sunday” and Micky Dolenz's “Randy Scouse Git” make their first appearances in a firstrun Monkees episode in “The Picture Frame” (a.k.a. “The Bank Robbery”), having first appeared in redubbed summer 1967 repeats (“Pleasant Valley Sunday” in “Captain Crocodile” [July 10, 1967], “The Case Of The Missing Monkee” [July 24, 1967] and “The Monkees On Tour” [August 21, 1967], and “Randy Scouse Git” in “The Spy Who Came In From The Cool” [June 19, 1967]). This is the first of 5 season-2 Monkees teleplays composed by Jack Winter, including the next episode, "Everywhere A Sheik Sheik", and Episode No. 36, "Monkee Mayor", No. 44, "Hitting The High Seas", and No. 45, "The Monkees In Texas". Winters passed away in December 2006. The rooftop set where J.L. and Harvey supposedly have Peter trapped during the “Pleasant Valley Sunday” number was used again in Episode No. 37, “Art, For Monkee's Sake,” in the scene where the boys, decked out in catburglar garb, climb on top of the roof to break into the museum and switch paintings. According to its Screen Gems Storyline, “The Picture Frame” (a.k.a. “The Bank Robbery”) originally ended with David scolding Peter for using their $20,000 reward for bail money for J.L. and Harvey. (Peter announces they own 50% of J.L. 's next movie!) It also stated that the baby picture which got Micky, Michael and David off was that of David Jones. About the same time of this episode's original telecast, The Monkees appeared on the front cover of TV Guide for the second and final time, on its Sept. 23-29, 1967 issue. The photos of The Monkees for both TV Guide covers were taken by Gene Trimble, who also photographed the faces of the boys shown in the series' end credits. The set used here as the interior soundstage of Mammoth Studios was previously used for the “Mary, Mary” romp in Episode No. 12, “I've Got A Little Song Here”. It will be used again in No. 41, "The Card-Carrying Red Shoes", as a theater for The Druvanian National Ballet, and No. 58, "Mijacogeo" (a.k.a. "The Frodis Caper"), as Wizard Glick (Rip Taylor)'s sinsiter arsenal in the KXIW-TV studio. The soundstage was first used in the April 16, 1966 episode of Batman (ABC, 1966-68), "The Riddler's False Notion" (prod. #8731 - Pt. 2); The Monkees use the same stage door which Batman comes in to find Riddler atop a stack of lumber. A rough take from “The Picture Frame” can be seen in Episode No. 49, "The Monkees Watch Their Feet". A second repeat of “The Picture Frame” (a.k.a. “The Bank Robbery”) on September 9, 1968 (following its April Fool's Day repeat) was the farewell appearance of The Monkees on NBC in prime time (not, as misbelieved, the August 19, 1968 repeat of Episode No. 56, “Some Like It Lukewarm” [a.k.a. “The Band Contest”]); it was replaced a week later in its 7:30 Monday stead by I Dream Of Jeannie, which, ironically, followed The Monkees in its first season. TV Guide erroneously indicated that "The Monkees Watch Their Feet" would air on that date! (Picture of the TV Guide listing for the September 9, 1968 repeat of “The Monkees Watch Their Feet,” 220k gif) “The Picture Frame” (a.k.a. “The Bank Robbery”) remains the only episode of The Monkees television show to experience two repeat broadcasts on NBC-TV. Several NBC stations, however, chose to preempt The Monkees' big primetime finale that Labor Day with a 30-minute pre-paid commercial for (unsuccessful) Democratic Presidential nominee Hubert Humphrey. Trivia Footnote: Interestingly, in the same week The Monkees finished its run on NBC, CBS unleashed Filmation Associates' The Archie Show on its Saturday Morning schedule, which featured none other than Don Kirshner as Music Supervisor! A CBS Saturday Afternoon repeat of “The Picture Frame” (a.k.a. “The Bank Robbery”) on September 2, 1972 (its fourth) concluded The Monkees TV series' 3-season run on The Eye Network. This episode marked Michael Nesmith's celluloid debut in his blue-green wool hat adorned with 6 buttons. A different edit of Tork and Richards' "For Pete's Sake" makes its first appearance in “The Picture Frame”'s end titles; this is the most commonly-heard edit of the tune, which will be used for the duration of The Monkees' second season. Trivia Footnote: According to Peter Tork, when The Monkees TV series was grabbed up for CBS and ABC Saturday Afternoon repeats, all 58 of its episodes had their end credits redubbed to feature "For Pete's Sake". Just as “Monkee See, Monkee Die”, the second episode of The Monkees' original run, had the honor of opening the 1966-67 summer rerun season, “The Picture Frame” (a.k.a. “The Bank Robbery”), the second first-run Monkees installment in Season 2, was the first summer repeat of 1967-68. This is one of many occasion which finds David squeaking out, "Oh!" Listen for him to say it again in the previous episode, "It's A Nice Place To Visit...", the next episode, "Everywhere A Sheik Sheik", Episode No. 38, "I Was A 99-lb. Weakling", No. 44, "Hitting The High Seas", and No. 52, "The Devil And Peter Tork". During the police interrogation, Micky, Michael and David run through an impromptu rendition of “Zilch”, a track from The Monkees’ Headquarters written by David Jones, Michael Nesmith, Peter Tork and Micky Dolenz and produced by Douglas Farthing Hatlelid. Note that only Micky and David are "singing" their lines from "Zilch" ("Never mind the furthermore, the plea is self defense." and "China Clipper calling Alameda.") whereas Michael "sings" Peter's line ("Mister Dobalena, Mister Bob Dobalena."). Here Micky Dolenz gets to exhibit directing skills for the first time in coaching Robert Michaels (Cop); he would direct Michaels again in his second showing as a "Cop" on The Monkees in Episode No. 58, "Mijacogeo" (a.k.a. "The Frodis Caper"), The Monkees' series finale--and Dolenz's directorial debut! Little did Micky suspect that this little chore would later on set the pace for his newfound career behind the camera as a director! When The Cop (Robert Michaels) riddles The Monkees' pad with bullets, the scene is intercut with a succession of old film clips which exemplify destruction. Brief snippets of the following episodes of The Monkees can be seen: Episode No. 24, “Monkees A La Mode” (a chicken flapping its wings in midair during the musical romp for “Laugh”) and Episode No. 37, "Art For Monkee's Sake" (a statue which David accidentally knocks over in the museum where the boys attempt to switch paintings). Also, clips from the 1965 20th Century-Fox release Those Magnificent Men In Their Flying Machines appear (a plane takes off a few feet then takes a nose dive, a plane with 5 wings that caves in on itself and a man with a rocket pack). It's the second episode of The Monkees to feature clips from the film, following Episode No. 2, “Monkee See, Monkee Die” (a plane takes off on a bridge then falls into the water, a man with a rocket pack, a blimp with a propeller, a plane with 5 wings that caves in on itself and a car that jumps up and down with a propeller attached to the roof). A second reference to the late actor Sonny Tufts is made on this series in this episode; the first was made in Episode No. 12, “I've Got A Little Song Here”. Tufts was in fact later among the crowd at the invite-only Los Angeles premiere of The Monkees' feature film HEAD on November 19, 1968 at The Vogue Theater on Hollywood Blvd. Paintings of George Washington and Abraham Lincoln can be seen hanging on the courtroom wall. Other Monkee references to America's 16th President can be found in Episode No. 36, "Monkee Mayor", No. 40, "Monkees Marooned", and No. 51, "The Monkee's Paw", and "Monkee Mayor", Episode No. 24, “Monkees A La Mode”, and No. 41, "The Card-Carrying Red Shoes", boast references to the first President. A unique, yet ersatz rendition of the 3-note NBC chime can be heard during the police interrogation scene where Micky hands out 3 degrees to Michael, David and himself. For those of you who were just as bewildered as the bank V.P. (Donald Foster) by the questions given in Micky's crossexamination, here's a quick rundown: the capital of Nova Scotia is Halifax, Hamasaka is a Japanese term literally translated as “little angel”, and it was Beau Bell of the St. Louis Browns who led The American League in doubles in 1937 by, in 642 at-bats, hitting 51 doubles, 14 homers, and 117 RBI. In the wake of The Summer Of Love, “The Picture Frame” (a.k.a. “The Bank Robbery”) marks the first utterance of the word "psychedelic." Other mentions occur in Episode No. 41, "The Card-Carrying Red Shoes", No. 45, "The Monkees In Texas", No. 49, "The Monkees Watch Their Feet", and No. 57, "The Monkees Blow Their Minds". And the black and white musical number of “Daily Nightly”, which appears at the end of "The Monkees Blow Their Minds" and Episode No. 48, "Fairy Tale", ends with Micky Dolenz saying, "Psychedelic!" The sign on The Monkees' table in court says, "Vote Innocent." Notice Peter with a Sherlock Holmes hat, pipe and magnifying glass as he attempts to uncover the evidence that will eventually exonerate his mates. Micky was previously disguised as Holmes in a dream sequence in Episode No. 2, “Monkee See, Monkee Die”. This is the third of five Monkees episodes which see them in gangster gear. Previous occasions were in Episode No. 7, “The Monkees In A Ghost Town” (Micky as The Big Man, Peter as Spider), No. 11, “Monkees A La Carte” (The Monkees imitate The Purple Flower Gang), and No. 25, “Alias Micky Dolenz” (Micky poses as Baby Face Morales); a fifth will be No. 46, "The Monkees On The Wheel" (The Monkees dress as crooked gamblers). The scene where Michael nibbles on a rose petal before The Judge parallels similar incidents in Episode No, 46, "The Monkees On The Wheel", at the end of the "The Door Into Summer" romp, wherein Michael walks over to the flower that Peter is holding (the one that keeps making everybody sneeze), takes a petal off and puts it in his mouth; No. 47, "The Monkees Christmas Show", in which David munches on fir bristles of a pine tree; and the tail end of No. 53, "The Monkees Race Again" (a.k.a. "Leave The Driving To Us"), which sees producer Bob "Robert" Rafelson scarfing on a crysanthemum. This is another occurrence on the show in which Peter saves the day! He also becomes the hero in the series premiere, “The Royal Flush”, Episode No. 13, “One Man Shy” (a.k.a. "Peter And The Debutante"), No. 48, "Fairy Tale", and the "silent movie" sequence in the movie HEAD. The "lady with the hat" which obstructs Michael's view in the mock movie theater sequence also appears in Episode No. 57, "The Monkees Blow Their Minds". As David, Micky and Michael enter The Ninth National Bank, David makes a rip on the famous tag line of the longtime Allen Funt favorite Candid Camera (ABC/NBC/CBS/Syndicated, 1948-78) with his comment, "Smile! We're on hidden camera!" Once again, The Monkees land in hot water due to a red herring precipitated by con artists. Here they are taken in by bank robbers posing as a movie crew; whereas in Episode No. 4, “Your Friendly Neighborhood Kidnappers”, they were tricked by the manager of a rival band masquerading as a publicity agent. The late Cliff Norton (J.L.) was a regular on Garroway At Large (NBC, 1949-54), portrayed The Boss on It's About Time (CBS, 1966-67), provided the voice of Ed Huddles on Hanna-Barbera's Where's Huddles (CBS, Summer 1970/1971), and played Harry on Dream On (HBO, 1990-96). He succumbed to lung cancer at age 84 on Saturday, January 25, 2003. 2 principal members of “The Picture Frame”'s guest cast, Dort Clark (Sergeant) and Joy Harmon (Cashier), both reappear on The Monkees in Episode No. 46, "The Monkees On The Wheel". Harmon knew Nesmith because she and Phyllis Nesmith attended the same church. Trivia Footnote: R. Robert Rosenbaum, assistant director of No. 32, “The Monkees On Tour”, directed Joy Harmon in a May 5, 1965 episode of Bewitched [ABC, 1964-72], “Divided He Falls”. Clark previously played a Policeman in Part 1 of the series finale of The Fugitive (ABC, 1963-67), "The Judgment" (Aug. 27, 1967), which also featured Paul Sorensen (“Monkees A La Carte”). The late Elisabeth Fraser (Judge) played Sergeant Joan Hogan in The Phil Silvers Show (CBS, 1955-59), which also starred Monkee guest actors Harvey Lembeck and Karl Lukas (both in “Monkees A La Carte”). Fraser previously appeared with pre-Monkee guest star Diana Chesney (“The Chaperone”) in a December 16, 1965 episode of Bewitched (ABC, 1964-72), "Speak The Truth," and with another pre-Monkee guest, Ruper Crosse ("Monkees Marooned"), in a February 18, 1966 episode of The Man From U.N.C.L.E. (NBC, 1964-68), "The Foreign Legion Affair." She passed away in May 2005 at age 85.